Recently I popped into Anthropologie to check out their Christmas lovelies. My monthly lovelies budget was pretty tapped, so I didn't go home with anything. 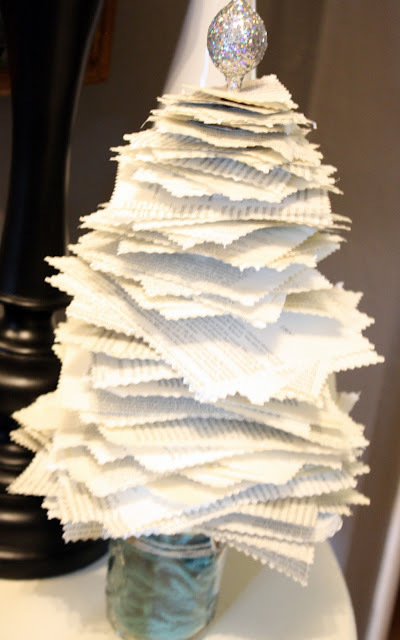 But, while there I spotted a 13" Christmas tree made from printed paper. So, cute, but at $48? No way that lovely was going home with me. Instead, I decided to make my own version. I started with an old book, my pinking shears, cardboard scraps (cut from a big diaper box) and a wooden skewer. Initially I was going to use a wooden knob for the topper, but I changed my mind and used a sparkly ornament. I then removed a stack of pages and cut them into varying sized squares. No need to measure, just wing it. Start with large squares and get progressively smaller. I decided that I wanted the base of my tree to be a canning jar because...that would be seriously cute, right? So, I hot-glued a cardboard square to the rim of the lid and added a small hole to the center to poke my skewer through. I then started layering a few paper squares at a time, followed by a small (1x1 inch) square of cardboard and then more paper. The small cardboard pieces just separate the layers a bit. Sometimes I layered two in a row and sometimes just a single piece. I'm a very relaxed crafter. If you haven't figured that out by now. Keep layering until you fill the skewer. When I had my tree stacked, I glued the bottom of the tree to my cardboard/lid base. And, that's pretty much it! You're ready to fill your jar with whatever you fancy and screw on the lidded tree. I added a small, sparkly ornament to the top with a bit of hot glue. Note: If your tree is wobbly, add a chunk of styrofoam to your jar and then fill around that. The skewer will poke into the styrofoam and stabilize the tree. I filled my jar with aqua yarn and that wasn't sturdy enough to hold my tree steady. Of course, mine has already floated around my house a bit. My decor is constantly wandering from room to room. Speaking of fickle? I've already changed my Christmas theme this year. I just didn't have enough stuff to really work Mod Lodge so I decided to take away the green deer paper we discussed last week and added black/white and aqua. I'm dreaming of a green red aqua gold silver brown black cream white Christmas. 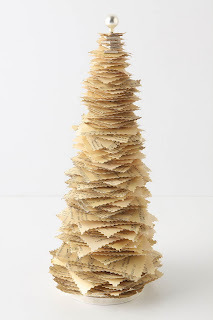 Well, hello little forest of paper trees. Welcome to my crazy Christmas tree collection. 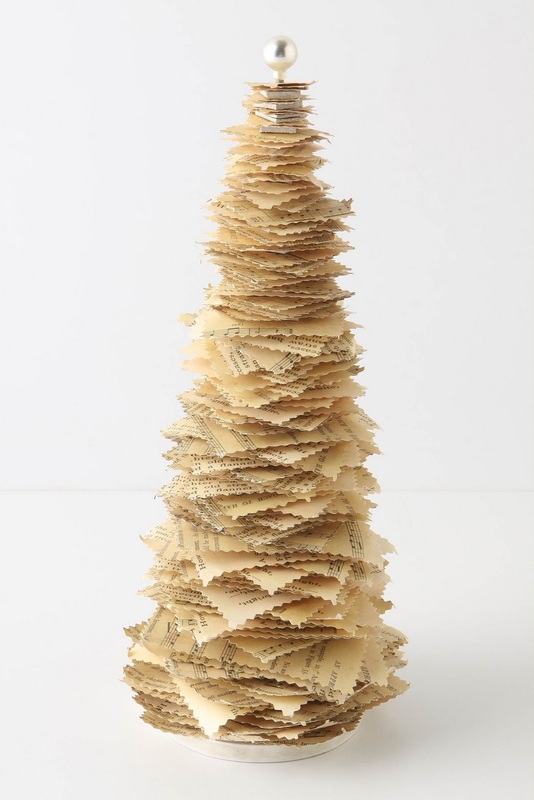 Love the tree idea...maybe if I get some extra down time I will try making one. You are a great crafter and have some really neat ideas...thanks again for sharing! Love you! I love Anthro-inspired projects and this one is great! I discovered you at Whatever Goes Wednesday, so thanks for sharing! Great project .. I'm totally in love with all things made from old text books too and can see this project being made in our home very soon. hahaha.. love this! what a great little tree addition your collection ;) def going to make one! I LOVE it!!! Anything Anthropologie for cheap is right by me!!! oh so cool! putting it on my craft to-do list!!! thanks for sharing! Oh I just have to try this!!! I love the scrapbook scissor cut edges on the paper!!! LOVE this tree, as well as all of your Christmas projects on the sidebar!! Would love for you to link up @ Find Your Craft Friday over on my blog... Have a great Friday! This is such a cute idea & I love all of your trees! Some had found supplements that helped a little as well. Showbox is the valuable and useful App that lets you both Download and Stream loads of Free Movies and TV shows you must try Latest showbox apk. Most of the butts are often about all-around poly hippo elephant seals which often physiognomy a unique toothed construction. Near to these very small ways this knapsack can almost any exceptional job via residing in organize. Frequent this inlet doesn't have a ado down payment on a construction loan possessing this huge handle with organize. Thanks To Share Some Information.